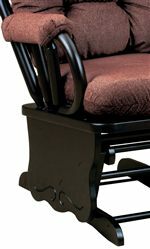 Bring home the best in comfortable, soothing gliding rocker chairs. This glide rocker chair provides you and your family with the relaxing comfortable gliding motion that people of all ages are sure to love. The casual styling is sure to go with any decor, and the ability to customize this piece makes it unique and one of a kind. Choose from four beautiful finishes and over seven hundred styles and colors of fabric and leather to create a look that you are sure to love for many years to come. Enjoy the exceptional cushioning and long-glide provided by this gliding rocker chair to create a relaxing retreat in your home. The Bedazzle Lock Glide Rocker with Tufted Back by Best Home Furnishings at Best Home Furnishings in the St. Louis, Chesterfield, St. Charles, MO & Waterloo, Belleville, Edwardsville, IL area. Product availability may vary. Contact us for the most current availability on this product. The Bedazzle collection is a great option if you are looking for Casual furniture in the St. Louis, Chesterfield, St. Charles, MO & Waterloo, Belleville, Edwardsville, IL area. Browse other items in the Bedazzle collection from Best Home Furnishings in the St. Louis, Chesterfield, St. Charles, MO & Waterloo, Belleville, Edwardsville, IL area.